Cacharel fragrance and perfume list. Cacharel fragrances: Cacharel is a French clothing brand founded by Jean Bousquet in 1964 in Nimes. In 1975, he partnered with L'Oreal to create a fragrance for the line, and in 1978 Anaïs Anaïs was launched. Jean Bousquet, son of a sewing machine saleman, took up tailoring at a young age. 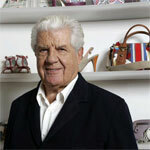 He opened his Le Marais fashion house, and created the Cacharel brand of clothing in 1962. In 1964 he founded the company of the same name. In 1975 he commissioned L'Oreal to create a fragrance to represent his Cacharel line, and in 1978 Anais Anais was successfully launched. Kate Moss latered modeled for the Anais Anais perfume campaign, and models such as Laetitia Casta (Promesse) and Gisele Bundchen have also appeared in ads for the Cacharel fragrances.